Image of the instrument developed for the instantaneous measurement of PM2.5 components. 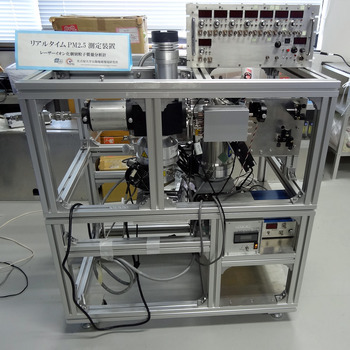 Professor Yutaka Matsumi and Dr. Takehiro Hidemori at the Solar-Terrestrial Environment Laboratory, Nagoya University, have successfully developed an instrument for measuring the chemical components in PM2.5 on a real-time basis. Moreover, they detected the origins of these components. Their paper was published in Atmospheric Environment on May 4, 2014. Aerosol particles such as PM2.5 have become an increasing health hazard concern, and several research institutes offer PM2.5 advisories. However, current identification is based on only the weight of PM2.5 in the air and does not indicate the presence of toxic chemical compounds. Existing technology requires day-long collection of PM2.5 on a filter and laboratory analysis for identifying its chemical compounds. Thus, it has been difficult to provide real-time information on harmful components in PM2.5. 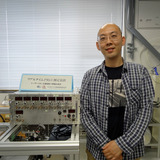 To this end, Professor Matsumi's research group has developed an instrument for instantaneous measurement that can cover all the processes of PM2.5 analysis from its collection to component identification. The instrument collects particles, ionizes them using a laser beam, and identifies the components by measuring the weights of the ions. Moreover, the group has produced PM2.5 from coal combustion in a laboratory and has measured the chemical component in PM2.5 using this instrument. The group observed PM2.5 at a remote island on the windward side of Japanese archipelago in the East China Sea. They discovered that when a maritime air mass from the Pacific Ocean blew on the island, few harmful materials were found in PM2.5; however, the number of harmful components increased significantly when a continental air mass blew on the island. It was estimated that majority of PM2.5 was produced by coal combustion because the components were similar to particles identified in the previous experiment as having originated from coal combustion. This research outcome can be used politically as scientific underpinnings in establishing a framework for emission control. It is widely expected that the results of future research using this instrument will gather increased attention for its application in environmental studies. Professor Yutaka Matsumi has researched aerial environment at RIKEN, a private enterprise, a judicial foundation and universities. Initially, he was involved in physicochemical research to examine chemical reactions. However, his interest in atmospheric chemistry increased because he determined that chemical reactions are more important for practical application in this field. Currently, he serves as the director of the Solar-Terrestrial Environment Laboratory, Nagoya University, and contributes to resolving global environmental issues. "Currently, PM2.5 advisories are issued on the basis of the weights of the particles in the air. I would like to develop a new PM2.5 measurement instrument that is relatively light and easily operated, that can provide information about harmful components instantaneously." "Environmental issues have been increasingly important as Asian countries develop. There are many issues beyond national boundaries that one country cannot solve alone. I hope you will join our research that aims to solve environmental issues, such as global warming and PM2.5, to ultimately make our planet better and habitable in the future." Dr. Takehiro Hidemori is a unique researcher who is also a Buddhist monk. He underwent three years of ascetic training after he received his master's degree. Thereafter, he began to long for new research, and he advanced to a doctoral program. While completing his course work, he participated in the GCOE program at the Tokyo Institute of Technology titled "From the Earth to 'Earths,' " and he became interested in atmospheric chemistry. Currently, he is a researcher at the Solar-Terrestrial Environment Laboratory, Nagoya University, and contributes to environmental solutions through his research on aerosol measurement. "In recent years, PM2.5 has attracted wide attention, and there is a growing need for the component analysis of air particles. Currently, analytical instruments are limited in the field of scientific research, and they have not been practically used. To contribute to our society, these instruments have to be offered at a lower cost. Moreover, to achieve practical realization, I believe we need to find some breakthroughs. I hope I can break down these walls and make a change." "I have considerably different experiences from most people in that I decided on an academic career at a later than average age. At first, I felt challenged to be behind others, but now I believe the experiences were rewarding in many ways. It's never too late to start what you want to do, and this advice applies not only to research. It's been three years since I started my research, and I always enjoy conceiving new challenges in my field."